What are Chick Days, you ask? Chick Days are nothing less than the very best time of year, the days in early spring when chicks are hatching and arriving at their new homes! For the next few weeks, Storey and our Chick Days partners* are celebrating Chick Days with daily giveaways, posting chick stories and photos, and providing chicken-raising information on our blogs and websites. Grab your morning coffee, and log on to start your day sunny-side up. The rise of the chicken to honored pet and newest productive member of so many households is a trend that has been widely written about. Why do we love these little birds so much? Is it the fresh eggs, their laughable antics, their contribution to our local food movement? Who can say for sure, but I can say why I love our birds. Because they are part of the family now. Because we held them when they were two days old and we hold them now. Because they have names and personalities. Because they belong to us now and they are part of our environment. They tend to look just right hanging out under the bushes and scratching along the walkway. A year ago we got our girls: a Plymouth Barred Rock, a.k.a. 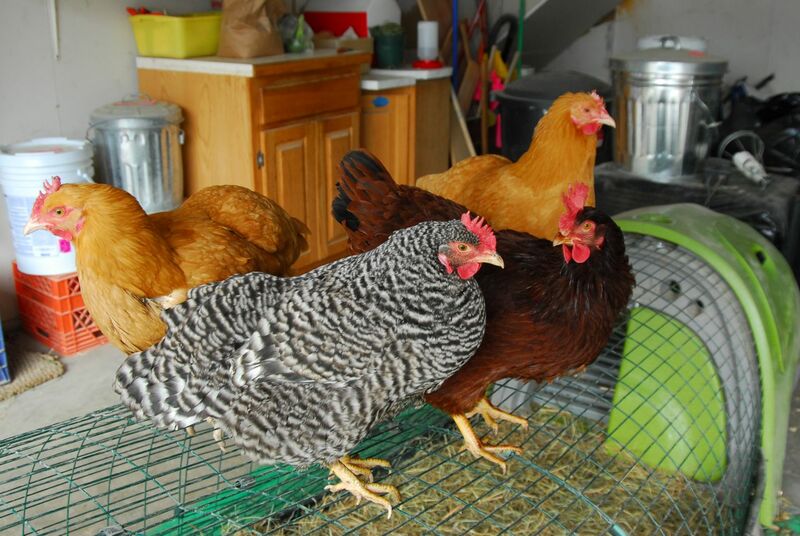 Amelia; a Rhode Island Red (named Ruby, what else); and two Buff Orpingtons, Buffy and Dixie (as in Dixie Chicks). Here they are at the start of their lives and our big adventure—life in a box in the middle of our living room. We sat around and gazed down at them for hours at a time. They slept close together, often with their heads in the water dish, and we worried they would drown. They pecked at their food together; even as babes they wanted what the other girls had and not what was in front of them, so all would often push together to eat out of the same hole in the feeder. But very early, within a couple of weeks, a pecking order was clear. We talked to them about “the other fellow first,” but it fell on deaf ears. Amelia, for some unknown reason, was Queen. She always had to be first. She always had to have the highest perch (even on the water feeder). Almost more distressingly, the other birds went right along with her and rarely challenged. They just let her be the Queen. Chicken childhood gave way to chicken adolescents. It’s not a pretty time for them, just as it isn’t for us humans. They reminded us of dinosaurs, and their feathers just seemed to grow out at odd angles from their bodies . . . and those delicious little downy feathers grew bony and their claws grew, well, clawlike. The only saving grace to the ugliness of chicken claws is that they make tracks shaped like peace signs. With the arrival of the teenage years, they got to go outside and make their way in the big bad world. Very scary for us to let them, just as when our boys got their driver’s licenses. Actually, though, I don’t remember my husband being as worried about our boys as he was about our birds. Hmmm. Out on grass for the first time! Being outside all summer, they grew confidant and loved trying out their flying and their racing around the yard. When we’d open the coop door in the morning, all four girls (Amelia always first) raced out into the yard as if they were late to a great party, possibly with some handsome roosters to dance with. Getting them to go back in was impossible, and often they ran the other way when we tried to get them. Our grandkids (the real people ones) were the only ones they would come to. Perhaps they recognized them as kindred spirits. Sometimes we didn’t know where they were. But they always came home when the sun began to get low in the sky. They’d saunter through the bushes and just appear, casually walk-strutting back to their coop, keeping their girl-secrets about where they’d been and what they’d done. It would be great if we lived in one of those climates without real winter, especially the kind of winter we had this year. But we don’t, so we had to think of a place to keep our girls over the winter. We have three sheds on the property, but none of them is really predator-proof — or heated. We pictured frozen birds some morning as we delivered warm water and organic laying mash. There was only one solution: We moved the coop and its run into the garage — with a tarp on the floor and 4 inches of hay (which we changed weekly). This has proved great for the girls and not bad for us, either. The garage adjoins the house, so we can check on them and gather eggs in bathrobe and slippers. The fact that our car is routinely buried in snow and encased in tombs of ice is irrelevant. We wouldn’t have it otherwise; we know our place in the pecking order. Their home for the winter — the garage. The black-and-white hen is Amelia, still the Queen. And now, it’s Chick Days again! 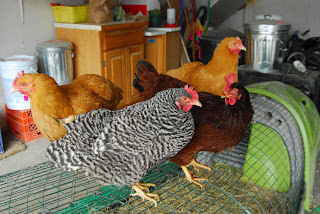 We’re getting ready to move our year-old hens outside . . . and they are more than ready to go outside. Their March afternoon forays on the cold, wet ground have toughened them up a bit, and while they won’t go onto the snow that still remains, they are finding lots of places they can scratch and peck and find some good bugs. We can’t believe a year has gone by. They’ve taught us a lot, these three chickens. I absolutely love it! After reading this post I really want to get more chickens. Many years ago we incubated and raised chickens as a project for our son. It was lots of fun and I enjoyed all the eggs and watching them but we eventually gave them away. I found your blog and website after finding one of your books Nature Connections. I am planning on ordering that book soon, from the samples I see it looks fabulous and will be a great edition to our home library for the little boys to use for their nature studies.